»Family»Is our children’s generation addicted to electronics? Is our children’s generation addicted to electronics? I went to the hairdresser this morning (YAY for me!) and we were talking about the looming election and I mentioned we need to invest adequately in education for our future. My hairdresser’s admittedly anecdotal evidence was she sees it every day. Young kids who can’t be separated from their digital lives. She has a friend whose 20 year-old son will, in her view, never get a job because he has no social skills whatsoever. She sees young kids come in with their parents to the salon and they have their heads glued to their phone games. She saw her own nephew glued to his computer to the exclusion of all else when recently on holidays. I remember taking my kids to the dentist or the doctor and they are bored without their phones to play on. How did we ever survive when we were kids? I agreed with my hairdresser than many of the younger generation write as they text: “C u l8er”. Hardly the makings of the next BHP CEO. With our kids, much of this is a novelty and I sort of hoped the novelty would wear off, but it is a worry. I have read many articles about the problem and I do wonder if we let kids have way too much electronic “stuff”. I recall reading about suicides in China of teenagers addicted to computer games, for example. Such articles have always worried me, but given I use computers for my work, I don’t see them in quite the same way – perhaps I need to take another look. As an IT professional myself, I hardly want to prevent my kids being computer literate, but there is a difference between computer literacy and addiction. My hairdresser ended up saying it is like addiction to poker machines. That got me thinking. I watch our Mr 15 with his games and to get him off them is hard. He’d be on there from the moment he got up to the moment he went to bed if we let him. Isn’t that addiction or very close to it? We educate our kids about substance abuse in schools these days – but what about this new addiction. 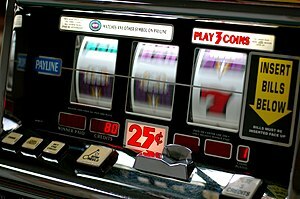 Computer games are very similar in some respects to poker machines. My hairdresser saying “These computer games are like poker machines to these kids” was when I had a bit of a light-bulb moment. Computer technology is a wonderful thing. I love it – but like many good things it also has a bad side. I know, for example, computer and TV screens should not be watched for about one hour before sleep and they “agitate” the brain activity and make sleeping difficult. Maybe my hairdresser is right. Maybe we need to take a closer look at all this stuff. If you’ve got kids, or you are a teacher, what is your experience? ← The Sapphires new cover: racist, sexist or opportunistic? I think computer games are changing the way we think, along with attitudes to matters such as violence. Its new and has yet to fully play out. One of the key casualties of the internet gen seems to be attention span. Doubtless all will level out in due course but I expect a discontinuity relative to what those of us who grew to adulthood in the late twentieth century regard as normal. OH YES! The attention span! I agree totally, it is written about a lot. TV started that – kids could only pay attention for the time between ad breaks, which has gotten shorter and shorter! Reading on the web means if you don’t “get” their attention in something like the first 3 seconds, forget it. Maybe why journalism has changed too and now seems so much more “sensation” driven rather than a reporting of facts, something many of us are complaining bitterly about over here. I hope you are right and it does level out over time. I suppose all innovations had unexpected impacts on the first generation that grew up with it. I wonder if the telephone raised such concerns with the previous generation all those years ago? I remember parents complaining bitterly about teenage girls (particularly) spending HOURS on the phone. These days they spend hours on Facebook. Is it just a different medium for a different time? Our schools forbid phones in call, but the kids can take them to school – which sort of defeats the purpose I think. A lot of the school work is now ALL on computers – for instance one class in Year 7 this year have no textbooks, all the reference material is pre-loaded on laptops. I’m really not sure it is the way to go. Glad to hear your half-brother seems to have reached a happy medium! Sadly, a lot of the hanging out with friends just means going to their place to play games. I’ve seen kids hanging around, every one of them texting or something. 😆 They seem to manage to talk over it, though. I wonder if that’s the way they will communicate in the future. Maybe, when they go to a job interview, the person who interviews them will be busy communicating with several other people on the phone/computer at the same time? Maybe the kids are actually learning a new skill they will someday need to get a job? That is a possibility indeed. It will be interesting. Imagine someone reading this and the comments in 50 years. They will probably LOL! Thank goodness he is a bit more moderate now, after a few serious talks to him and now that he got married. I do hate when people have their phones by their side on the table when having a meal, it’s as if they can’t miss a single message. I notice my young Uni colleagues have their phones with them all the time and are always “clicking away” which bugs me no end, as they can’t be doing much work if they are always “chatting” or “posting” stuff!! I so wonder if the next generation will be better – more moderate. Seems our generation learnt computers and ran with the technology professionally, but this generation is using for leisure and seemingly it is problematic, while the next generation may take a more balanced approach. My youngest son is addicted to video games….thank the universe my ex-boyfriend makes him live real life…has him working. I am thankful for his good influence. Seems to be a world-wide issue, doesn’t it? From the wilds of Canada to the outback of Australia!